For my lunchtime run today I decided to go that little bit further (a) to test my groin out and (b) becuase I haven’t done much training this week. My 3.75 miles route around Swansea Marina and SA1 took me 32 minutes and 37 seconds. I’m disappointed with my times at the moment, but they’re bound to be on the slow side given the limited training I’ve done since the turn of the year. 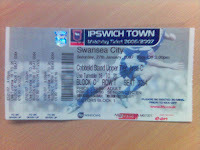 I finally got my hands on a ticket for the Swans visit to Portman Road to meet the Tractor Boys from Ipswich today, in what should be a cracking FA Cup 4th Round tie on January 27th. I had to laugh though, as on the ticket (just below the Ipswich Town bit) the printers have obviously had a bad day at the office as it says “FA Cup 3rd Round Replay”. Nice one chaps, but we’re called Swansea City not Chester City! All together now – “I can’t read and I can’t write, but I can drive a tractor” . . . . .